Rumour has it that he files a flight plan every night before he departs for dreamland, and that his family lives in area 51. The only thing we know is that he calls himself ……. “RAND, RAND I WANNA LAND” was my call when I approached Rand airport during my first solo cross-country to controlled airports. When the air traffic controller requested my call sign and location I told her that I am not a fighter pilot (yet) but she can use Astrix or Obelix as my call sign for now. I could hear that she had the flu as she coughed after I told her that I was directly above at 2000ft (just as I join my home field). I suspected that she liked me when she wanted to know if I was alone by tactfully asking “Who is the pilot in command?”. I confirmed that I was a student and that there was no “pilot in command”, I was the only one in the aircraft. My suspicions were confirmed when she invited me to meet with her face to face in the tower after landing. This sounded promising and I never thought that my wings (or the half wing I had then) would produce results so quickly. Meeting her in the tower I realised that she was from the same place as me, mother Russia. Only Stolichnaya (Russian Vodka) can give a face such a bright red colour but typical female, I have not even made the first move and she was already complaining about me entering her space without her permission! I have had girlfriends like this before and I was not going through this schizophrenia again, so I disappeared as quickly as I could, jumped in the schools aircraft, but when I called for departure clearance, she told me that she was reluctant to let me go. This confirmed it, I knew that I must go, go as fast as I could and as far away as possible. My first encounter with ATC was not a very enjoyable experience (but I hear that all new pilots go through this in the beginning) so I requested permission from ATNS to visit the Lanseria tower to see what it is they do, why they do it and how to become an ATC. Of course I knew (or thought I knew) that all an ATC does is to say “one aircraft here, another there, QQHH 1234, wind light & variable and you are clear to land. So, on my arrival I jumped straight into the hot seat and started controlling. I first started playing with the Lego blocks in front of me but because they can only move up & down I quickly became board. I then looked at the computer screens but that appeared very complicated especially with so many people constantly speaking to you while you are trying to play the game and that was not an option either. 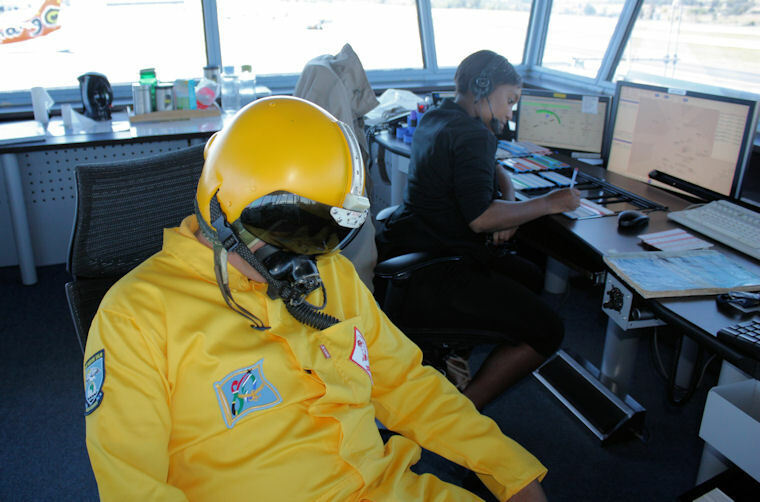 When some started talking about Flight Level 96 something, Radial 420, ILS, DME and what code they should kwak, I knew that I was not ready for this zoo and handed the chair to Bontle Mabe, an experienced approach controller at Lanseria. 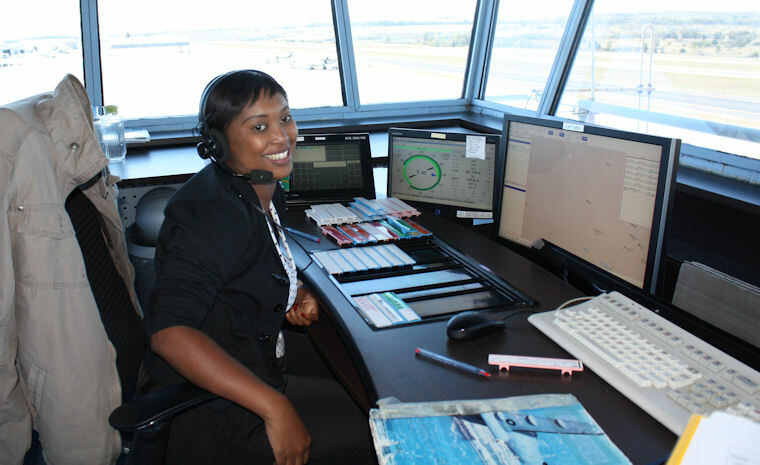 Bontle has been an air traffic controller since 2008 and it was clear that she has a passion for this responsibility as the other controllers I met during my visit. She explained that an ATC must be proficient in English (which I am) with good English comprehension and common sense (I am not sure about this one). But first things first. What is Air traffic control (ATC)? 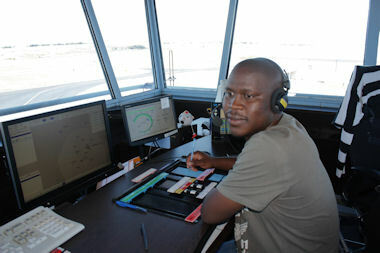 ATC is a service provided by ground-based controllers who direct aircraft on the ground and in the air. The primary purpose of ATC systems is to separate aircraft to prevent collisions, to organize and expedite the flow of traffic, and to provide information and other support to pilots. As per the ATC definition, it is a service provided to pilots and also to the weekend warrior who gets stage fright every time he pushes the PTT and as a result refuse to fly into controlled airspace or even worse, keeps quiet when he flies. ATC is not there to police your actions or report on your petty mistakes. They are there to guide you for your own safety and the efficiency of the entire industry. 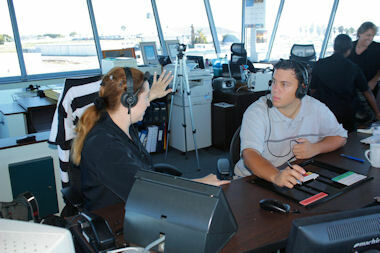 It is a myth that ATC is unfriendly and everyone should know that they encourage you to communicate. If you are unsure, give them a call before the time, warn them about your inexperience and ask them for assistance. Don't destroy the entire circuit flow and jeopardise the safety of others by failing to communicate your mistake. If you are nervous and inexperienced, anticipate the ATC instructions. You know that you will be given the QNH, runway in use, next reporting point and altitude when you are inbound. All just common sense if you take the time and think about it. So how do you become an ATC? To become an ATC will require hard work, determination and the ability to work well under pressure. The good news is that the ATC roadmap is well defined and the resources & training facilities are right here, local in South Africa. ATNS ATA (Aviation Training Academy) have a wide range of training curricula available for aspiring air traffic controllers which offers both theoretical and practical training. 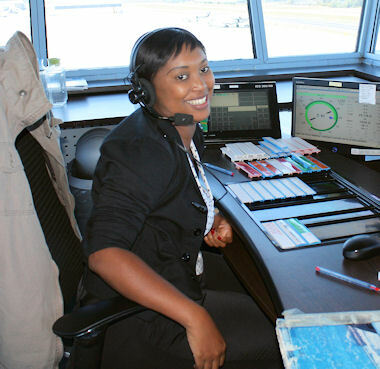 The ATSA (Air traffic services assistant) will be the initial step in your new and exciting career. This stage will require a three month theoretical course introducing you to the principals of air traffic control and will of course include the laws and regulations related to air traffic. This will be followed by nine months to one year of practical training where the ATSA will be occupied with the processing of flight plans, NOTAMS, the information passed between controllers and other administration tasks. With a further one month of theoretical training and two to three months of practical training you may be able to progress from an ATSA to either a Tower Controller or an Information Controller. 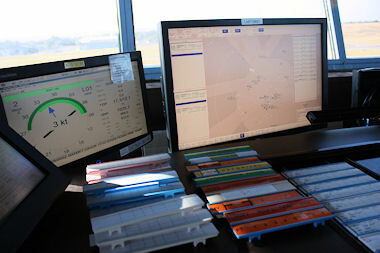 In a nutshell, the Information controller will communicate with aircraft already in the air and flying between airports. The idea is to provide them with flight level information, create awareness of other air traffic in the vicinity and of course also to track flight progress and hand the information to other sectors receiving the aircraft. 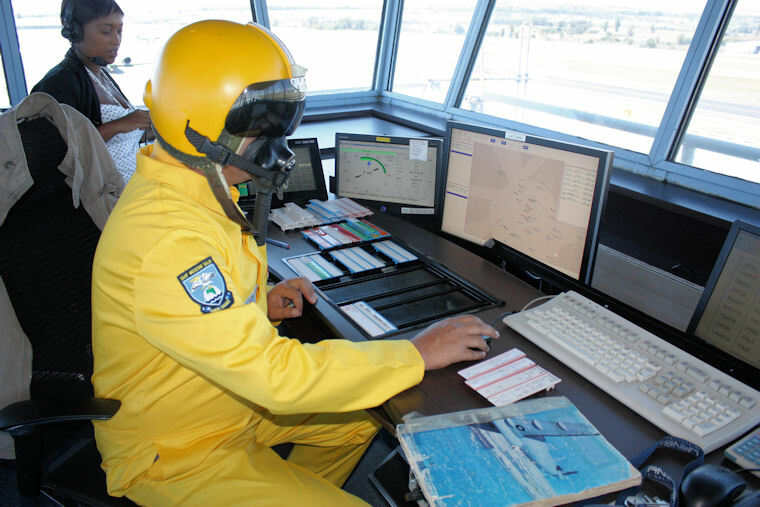 The Tower controller on the other hand will be based at a smaller airport without approach services and in simple terms, the controller performs his or her responsibilities purely based on visual referencing. 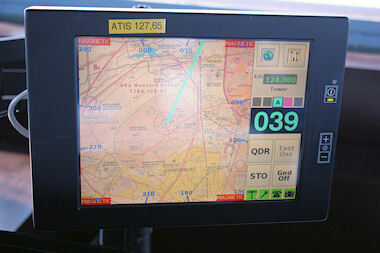 Airports with more advanced technology and equipped to guide aircraft in and out bound without visual reference will require an ATC with an Approach rating. Either a radar approach rating (where traffic is monitored and vectored based on radar information) or a procedural approach rating (where documented procedures are to be followed by pilots to and from the airport). In this environment the pressure on controllers become high as mental pictures needs to be created and adapted all the time as there is no visual reference and the tracking of aircraft now becomes critical. The theoretical training for this level of proficiency can again be completed at ATNS ATA but this rating still require a validation which will only be granted after an estimated six months to a year when instructors have guided and drilled you through all the routines and are confident that you are capable of this huge responsibility. Every airport has different requirements and the ATC shifts may therefore also be different depending in which tower you serve. However, the principals of an eight hour shifts is most common and includes morning, afternoon and evening shifts. At Lanseria, there are times during the day with high volumes of traffic and services are divided between ground operations and tower operations to spread the load between controllers. At night the traffic volumes reduce significantly and the same controller may serve both ground and tower operations at the same time. During every shift, a relief controller will take over your responsibilities for one hour and you may use this time to relax. Automation is key in a busy and highly tense environment such as this and it is important to have adequate technology to increase your awareness and accuracy. 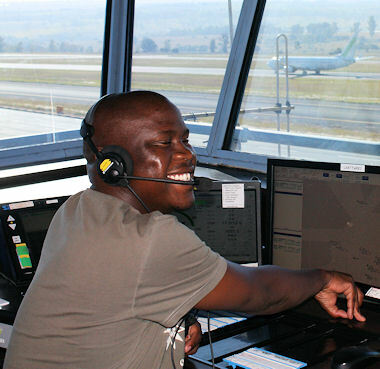 At Lanseria there are many systems to support the controllers and although Lanseria only provide procedural approach services, the tower is equipped with secondary radar to identify and track aircraft through their airspace. A system tracking the direction of originating radio broadcasts is another interesting tool and a system providing surface conditions such as wind speed & direction, atmospheric pressure and temperature is obviously also present. The tools and systems in the tower provide precise information about aircraft and their locations but one thing the systems can't provide is information regarding the proficiency of the pilot or the pilot's frame of mind. Have you ever flown to an airport, placed in a holding pattern and ATC then clears the aircraft behind you in for landing? Sounds unfair but is it possible that the ATC sensed the anxiety or disorientation of the other pilot? Is it perhaps safer to get him out of the group flying in the hold? 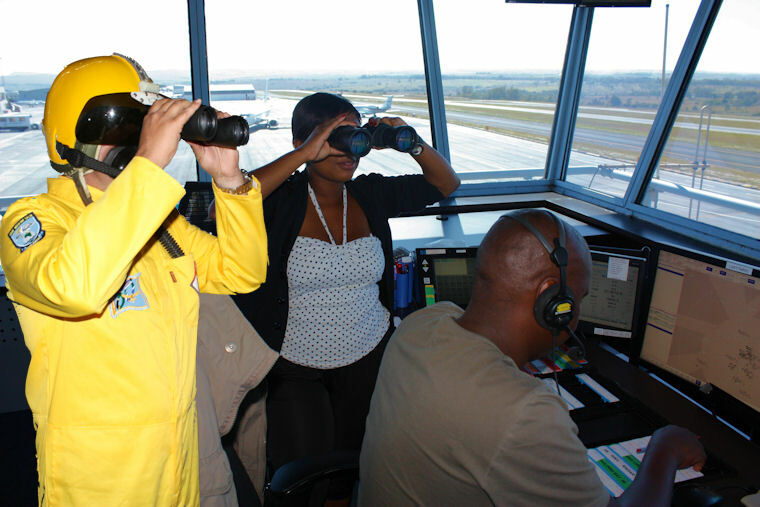 Air traffic controllers are trained to evaluate every situation and act accordingly. They have no reason other than safety and efficiency to prioritise someone else over you. Air traffic control at large international airports are challenging but remain mostly IFR while the smaller airports deal mostly with VFR. At Lanseria the combination of IFR and VFR introduces significant challenges as the separation requirements (and procedures) are vastly different. In addition, the C172 on a VFR flight requesting joining instructions more or less the same time as the B737 on an IFR flight poses a new dimension to the problem. Although the C172 is much closer, it is also much slower and both aircraft will probably be on short finals at the same time. Who does the ATC delay and how? If everyone consider just this (a simple example and the tip of the iceberg) then you will have a better understanding and relationship with ATNS. They are truly a friendly bunch of people but you first need to engage or visit them to experience it for yourself.